What has been revealed is that U.S. troops operating in advisory roles across Africa lack the level of support they have received in Afghanistan, Iraq and Syria. The Pentagon is still investigating the Oct. 4 ambush of a joint U.S.-Nigerien patrol to determine what happened and why. Although the mission in Africa is focused on training and advising the host nations’ partner forces, the incident in Niger has highlighted the considerable risk faced by participating U.S. troops. Military officials suspect the Islamic State in the Greater Sahara, or ISGS, as the culprit behind the deadly ambush, but West Africa is dotted with various terrorist groups, including Boko Haram, Jama’a Nusrat ul-Islam wa al-Muslimin, al-Shabab and al-Qaida in the Islamic Maghreb. Despite the influx of terror groups and instability in the Sahel over the past several years, Libya and Somalia remain the only two regions where U.S. warplanes and drones have authorities to launch deadly kinetic strikes. There have been no U.S. airstrikes and drone strikes anywhere in Africa besides Libya and Somali, Samantha Reho, a spokeswoman for U.S. Africa Command, told Military Times. Though U.S. forces training and advising partner forces in places like Niger still conduct operations that closely mirror more robust counterterror missions — to include surveillance, intelligence collection and dissemination, and reconnaissance operations — those forces operate without much of the support that would come with a combat-oriented mission. Gen. Thomas Waldhauser, commander of U.S. AFRICOM, tried to address those concerns before lawmakers earlier this year when he presented his posture statement for the region. “For personnel recovery, Africa Command relies heavily on contract Search and Rescue assets due to lack of dedicated assets to support operations,” the statement reads. 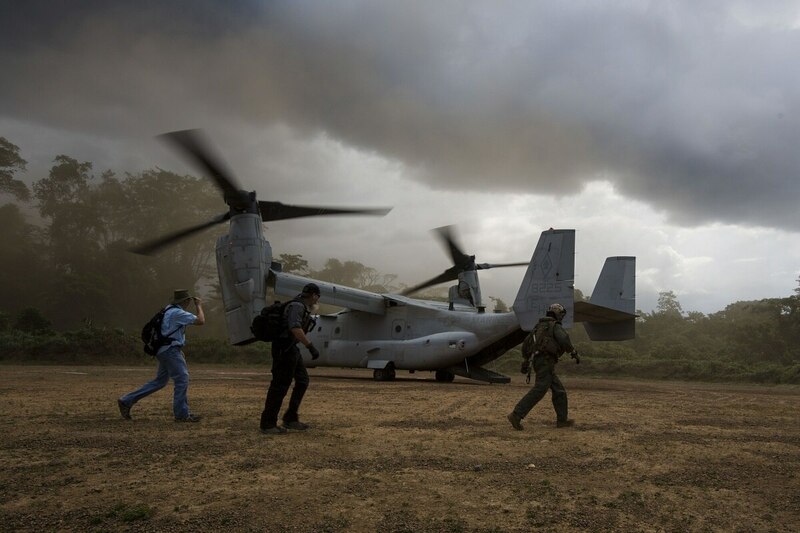 Although the U.S. mission in AFRICOM has grown steadily over the past several years, AFRICOM is no closer to closing the gap to ensure U.S. forces are fully supported in the region. There are currently 6,000 U.S. troops in the region, spread over 53 countries, Gen. Joseph Dunford, chairman of the Joint Chiefs of Staff, told reporters at the Pentagon in October. But only a handful of U.S. forces are actually conducting civil affairs missions and training and advising host nation forces, meaning providing support to those forces is a complicated task that may require a much larger footprint. The majority of U.S. troops are in Niger and Camp Lemonnier in Djibouti, Reho explained to Military Times. “We maintain 15 enduring locations (2 Forward Operating Sites and 13 Cooperative Security Locations) on the African continent, which give the United States options in the event of crisis and enable partner capacity building, Reho said. “Additionally, the command has designated 31 contingency locations … focused on access to support partners, counter threats and protect U.S. interests in East, North and West Africa,” she added. Interviews with local villagers have cast a disturbing story of U.S. troops outnumbered, outgunned and alone the night a force of nearly 200 enemy forces launched a well-coordinated attack using trucks, motorbikes and heavy weapons. However, despite what looks like a massive expansion into Africa, U.S. forces can’t even adhere to a Pentagon policy that requires U.S. forces to have the ability to evacuate the wounded and transport them to a trauma facility within the first hour of sustaining an injury, the so-called “golden hour” that can mean the difference between life and death. In Niger, the U.S. has no strike assets or search and rescue platforms to whisk injured troops off the battlefield. According to a New York Times report, French aircraft responded to the incident in Niger, but their airbase in Burkina Faso is roughly 275 miles away. The U.S. military is actively looking for solutions to the problem. The 2017 posture review recommended the use of more maritime assets, like during Operation Odyssey Lighting in Libya, in which U.S. air assets and drones helped push ISIS fighters out of the Libyan city of Sirte in December 2016. 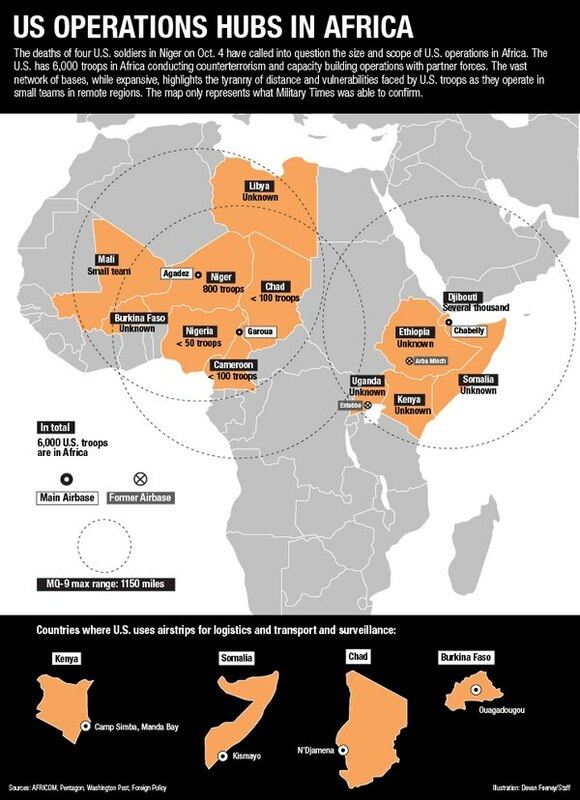 According to the posture statement, “Only 20-30% of Africa Command’s ISR requirements are met” despite a sprawling network of U.S. drone bases and temporary logistics runways. “This amphibious capability, during OOL, supported maritime-based ISR operations, and Africa Command could further exploit this capability to support additional operations against regional threats, the statement reads. The onsite visit is part of a formal investigation launched by AFRICOM. Many of the countries where U.S. forces are operating only have a handful of U.S. troops, usually under 50. Logistics support is simply not there, and access to other sophisticated military hardware or U.S. up-armored vehicles, like mine-resistant ambush protected vehicles, is not entirely feasible, former U.S. special operations forces have told Military Times. U.S. troops usually accompany partner nations forces in thin-skinned vehicles, as was the case in Niger the night they were ambushed, according to CNN. The U.S. troops came under attack by rocket-propelled grenades, mortars and machine guns. Armed only with rifles and one heavy machine gun, they managed to kill 20 attackers, CNN reported. U.S. troops were lightly armed, driving Toyota pick-up trucks and wearing T-shirts and baseball caps and no body armor, a Nigerien soldier told CNN. “I was surprised that the Americans would go out into the zone with such a light convoy and no air cover, no drones to keep watch over them,” the soldier added.